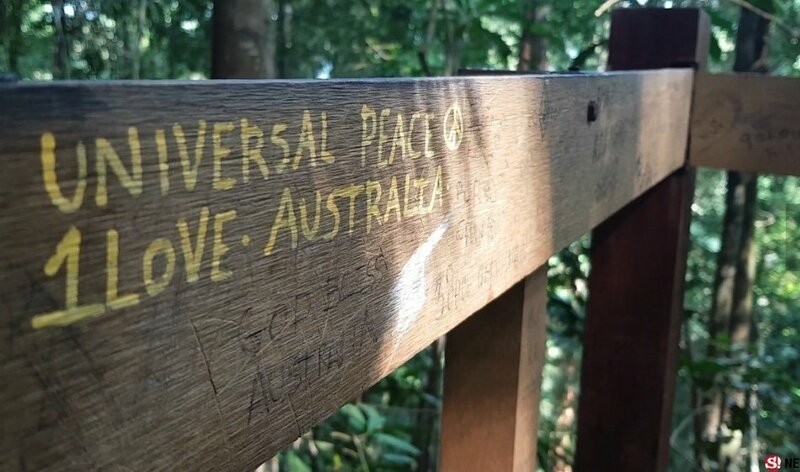 There are many examples of "I was here" and love type messages in foreign languages on the steps leading up Khao Ngon Nark hill. 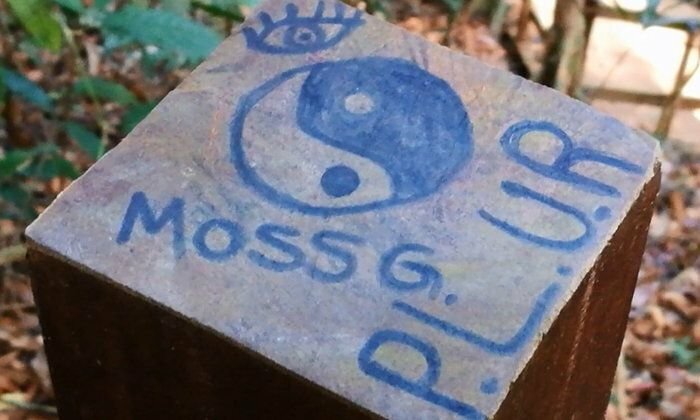 A park official blamed copycats for the graffiti - once some people did it others followed. The 500 meter trail leads up to a 360 degree viewpoint and is contained within the Nopparat Thara - Moo Koh Phi Phi national park area. Don't worry Krabi, you won't see and my family anymore....i have never seen a nice trail in Thailand, only very dangerous ones where i almost broke my wrist after falling from the rocks because there was nothing to hold on to. Take a ride round the side streets of Jomtien....Thai tagging everywhere, dont see that advertised or even worse never cleaned. But Thai graffiti is uglier. Sorry, but nice trails where in Thailand? Even in the National Parks mostly everything is rotten down due of lek of maintenance!!!!!! And for that they charge 200-400 bath. I don't visit any NP in Thailand anymore and force friends visiting Thailand to stay away!! This is terrible. 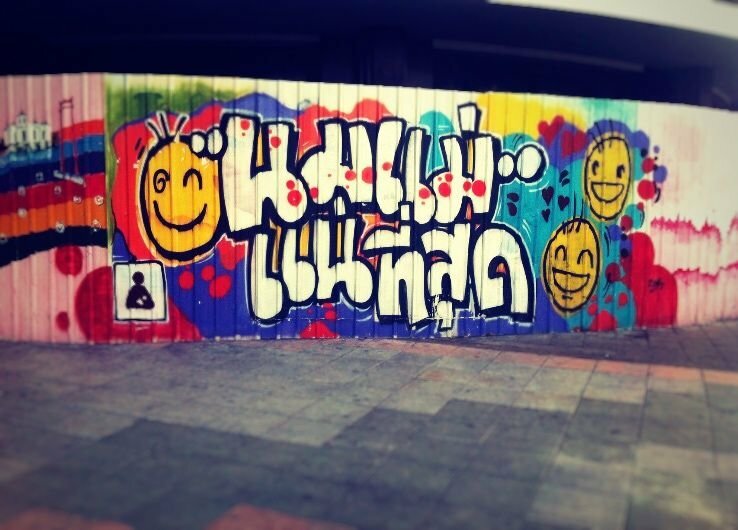 Thais people, even Thai youth, would never think of tagging pristine Thailand with graffiti. Ok, and even should some wayward, foreigner influenced Thais tag a structure, everyone knows that Thais, especially Thai youth, are the salt of the Earth - just kids being kids; foreigners on the other hand are simply criminals. I'm from Ireland, when I see graffiti in the city I don't care much, when I see graffiti along nature trails it annoys me. This is a concept I seem to share with Thai authorities, but completely boggles the minds of you lot. Same in CM. Foreigners get the press (evil foreigners); Thais who are responsible for the lions share of the tagging, especially gangs, aren't discussed, don't get negative press (loss of face for Thais and Thailand in general), and are given a pass. There is graffiti everywhere, but only foreign tagging is visible to kon Thai. Thailand keeps beating that same drum: Foreigners bad, foreigners bad! It gets old. It annoys me too. But graffiti is a phenomenon that is not based on race or country of origin. The people who tag in parks and forests are simply discourteous jerks irregardless of their nationality. But whenever the people and institutions of a country start redirecting blame for societies woes on foreigners and 'outsiders', it's simply an exercise in applied racism. I'm from Norway, I feel the same as you. Clean up your own mess before you point fingers at others!!! I hate stupid tags anywhere, be it in the city and even more so in nature. Thai or English or Chinese, doesn't matter. 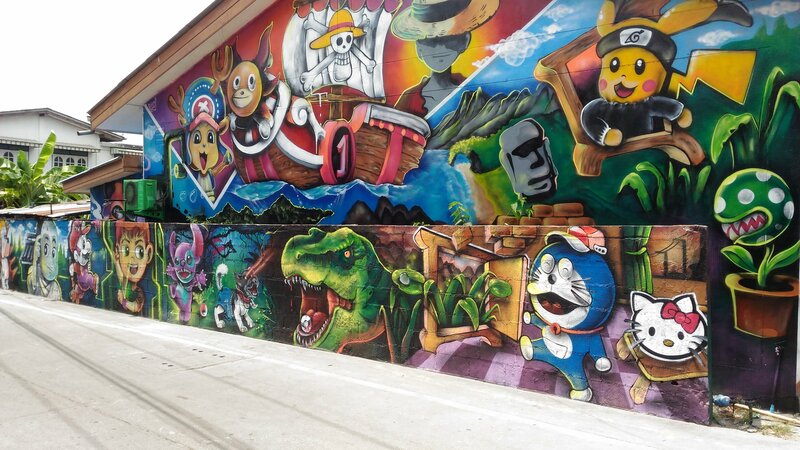 On the other hand, an artistic graffiti or murales, that's something else. But even that should reflect the place around it and most importantly, be approved by those who live there.